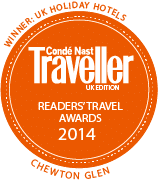 Congratulations also to Andrew Stembridge and his team on their fantastic achievement as UK hotel of the year by Conde Nast Traveller. The awards for this fantastic hotel keep piling up and it well deserved. Condé Nast Johansens 2014 Annual UK & European Awards for Excellence – winner of the category ‘Best Hotel for Romance’.